Rohloff’s SPEEDHUB 500/14 internal gear hub offers numerous advantages for e-bike users. The ultra-wide 526% gear range is ideal for the higher speeds and steeper hills you can conquer with an e-bike, and the SPEEDHUB is capable of handling a much higher torque load than traditional, derailleur-based drivetrains. 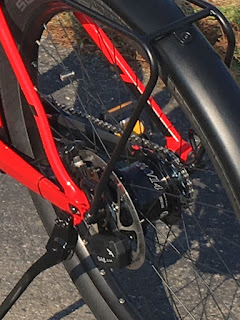 The SPEEDHUB’s internal gearing is also virtually impervious to the elements and heavy use, particularly when paired with a belt system from Gate Carbon Drive. This makes it an especially attractive choice for riders who commute daily on their e-bikes or ride in wet weather and muddy conditions. Last year, Rohloff introduced a new electronic shifting system for use on mid-drive, Bosch-equipped e-bikes. Developed hand-in-hand with the engineers at Bosch, the E-14 system communicates with the Bosch controller to instantaneously drop motor output torque when a shift is initiated, providing a smooth transition that won’t disrupt your pedal stroke. A single shift takes just 200 milliseconds, and riders can hold down the bar-mounted shift button to shift in increments of three gears at a time. As you click through the gears with these ergonomic up-down buttons, the integrated Bosch display unit will ensure you always know which gear you’re in. 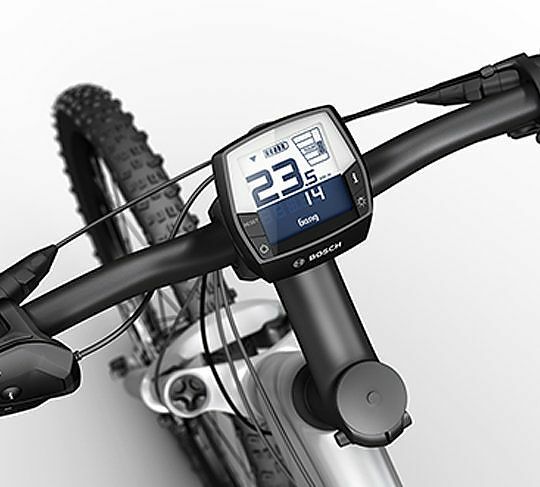 The E-14 system remains exclusive to Bosch e-bikes for the time being, and was initially available only to manufacturers for use on new bikes. However, Rohloff has recently approved the system as an aftermarket retrofit for certain Bosch-equipped e-bikes. 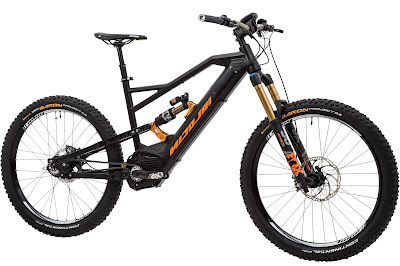 Nicolai's EBoxx E-14 electric mountain bike features the electronic shifting system along with Gates Carbon Drive. It's also available from Cycle Monkey. Cycle Monkey can now help your local shop retrofit your Bosch e-bike with electronic shifting. By offering E-14 as an aftermarket kit, Rohloff has also opened the door to additional options from small frame builders. So, what does it take to install E-14 on your bike? Is it possible to route the Rohloff E-14 wire harness through the frame? Can the Rohloff E-14 DC/DC-CAN Converter (cylinder measuring Ø 22mm x 100mm with 3 exit wires) be installed in the downtube/seattube such that wires can reach the motor mount? Will the frame accommodate the E-14 DC/DC-CAN Converter alongside existing wires? Can the frame accept the E-14 Shifter Unit without interference of other external components? Note that this relates to the dropout area and the E-14 unit is slightly larger than Rohloff’s mechanical external gear mech. Is the motor centered in the frame or offset? In addition to these mechanical considerations, the Bosch controller will need new software installed that allows the system to communicate with E-14. In most cases, the original manufacturer of your bicycle will re-flash the software remotely through one of their dealers. Those hoping to retrofit their e-bike should be keep in mind that the verification process takes some time and will involve some labor costs, even if the frame does not end up being compatible with E14. Reaching out to the shop that sold your bike is the best place to start to get a quote for what the costs will be. Don’t hesitate to have them contact us should they have additional questions, and feel free to share this document as an outline of the process. Shoot us an email to set up an initial consultation to discuss the retrofit of your current bike or inquire about custom builds based around the system.